Brands made the most of Diwali, as usual, and created engagement options on Facebook for their new campaigns or just to reconnect with existing fans. Here are a couple of applications that I checked out. Oreo did an amazing job with creatively using its famed cookie as a lamp and Rangoli in its Diwali related fan engagements. In my opinion, their Diwali image post was by far the best brand post for the Festival of Lights on Facebook. 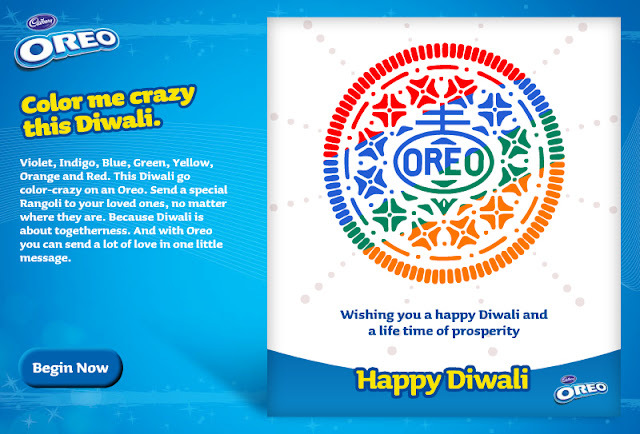 Oreo also created a simple Rangoli application where Fans could colour the cookie, couple it with a message and send it out to their friends on Facebook. Fun way to bring out the brand connect. 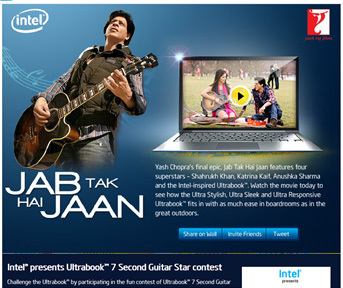 Intel Ultrabook is promoting its association with the latest Diwali release Jab Tak Hai Jaan with its new 7-second Guitar Star Contest on Facebook. The contest theme ties the movie and product together. It takes an Ultrabook 7 seconds to boot, and the brand is asking users to upload a photo or video with a Guitar a la Shah Rukh Khan in the movie. Participants can use whatever other props they can get hold of and pose like a Rockstar, all within 7 seconds. There are Gibson Guitars and autographed Ultrabooks to be won. The app page also showcases mall activation videos.